It is critical to immediately begin a rapid reduction in CO2 and other greenhouse gas emissions. The degree of climate crisis that humanity will experience in the future will be determined by our cumulative emissions; rapid reduction now will limit the damage. For example, the Intergovernmental Panel on Climate Change (IPCC) has recently assessed that halving CO2 emissions by 2030 (relative to 2010 levels) and globally achieving net-zero CO2 emissions by 2050 (as well as strong reductions in other greenhouse gases) would allow a 50% chance of staying below 1.5°C of warming. Considering that industrialized countries produced more of and benefited more from previous emissions, they have an ethical responsibility to achieve this transition more quickly than the world as a whole. The basic explanation for why CO2 and other greenhouse gases warm the planet is so simple and has been known science for more than a century. Our atmosphere is transparent to visible light — the rainbow of colors from red to violet that make up natural sunlight. When the sun shines, its light passes right through the atmosphere to warm the Earth. The warm Earth then radiates some of its energy back upward in the form of infrared radiation — the “color” of light that lies just beyond red that our eyes can’t see (unless we’re wearing infrared-sensitive night-vision goggles). If all of that infrared radiation escaped back into space, the Earth would be frozen solid. However, naturally occurring greenhouse gas molecules, including not just CO2 but also methane and water vapor, intercept some of it — re-emitting the infrared radiation in all directions, including back to Earth. That keeps us warm. 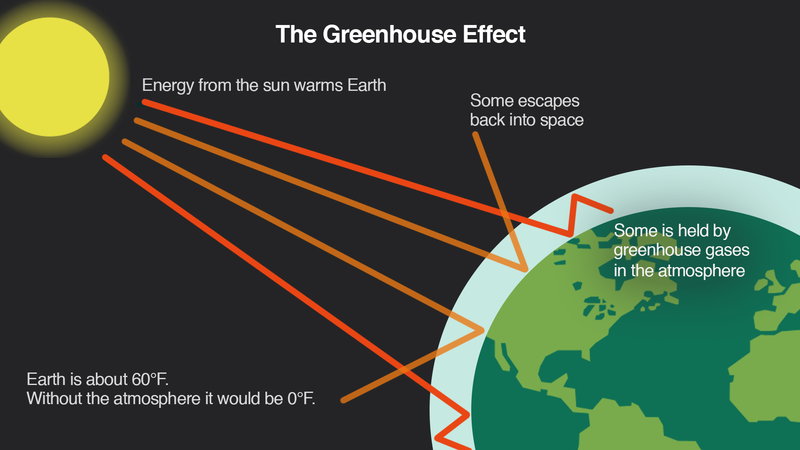 When we add extra greenhouse gases to the atmosphere, though, we increase the atmosphere’s heat-trapping capacity. Less heat escapes to space, more returns to Earth, and the planet warms.